Donald Trump would like to chat. And, boy, is he ever. Riding high after Supreme Court nominee Brett Kavanaugh's successful confirmation, the president has been on a rollicking press tour of late. He's inviting reporters up to his private cabin on Air Force One. He's calling in to his favorite shows. And he's turning closed White House events into major media moments. 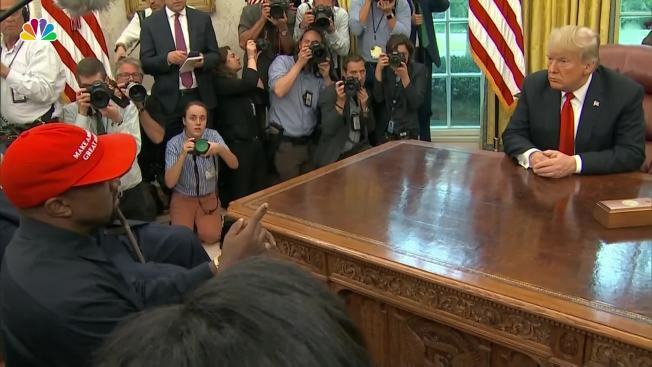 On Thursday alone, Trump held four separate press availabilities, including one that featured a profanity-laced Oval Office performance by Kanye West, the rapper and producer who has emerged as Trump's top Hollywood fan. And that's not counting the more than 45 minutes he spent on the phone calling in to "Fox & Friends." The president's inclination to chat comes as Trump has been enjoying a spate of good news for his administration. While the Russia investigation still looms and polls still predict major Republican losses in the House in next month's midterm elections, Trump has been logging a series of wins, including appointing a second Supreme Court Justice to the bench and reaching an updated North American trade deal with Canada and Mexico. The stream of negative headlines that have been a constant presence through most of Trump's administration, has abated — at least for a time. "I think he's having a lot of fun right now," said former campaign adviser Barry Bennett. "There hasn't been a bad story in over week," Bennett marveled. Said White House spokeswoman Sarah Huckabee Sanders: "The President is his best messenger and it's always a great thing when the American people can hear directly from him." Trump's recent media blitz began on Saturday, when it was clear that Kavanaugh had the votes to be confirmed after a bruising fight in the Senate. The president was en route to Topeka, Kansas, for a rally as the final vote was happening, and he invited the small group of reporters aboard up Air Force One up to his private cabin to watch history unfold. When the vote was cast, Trump delivered a double thumbs-up from his desk and declared it all "very, very good." Trump had already spoken with reporters as he departed the White House that day, and he stopped to chat again after he landed, to share details of the congratulatory call he'd made to Kavanaugh and his family. After an hour-plus rally that night, Trump was back at it, calling up one of his favorite hosts, Fox News Channel's Jeanine Pirro, as he drove back to the airport in the presidential limo. He continued the conversation on the dark tarmac, under the shadow of his plane. After a brief respite for golf on Sunday, Trump was back at it Monday, taking reporters' questions both as he left the White House and again as he returned from a speech to police chiefs in Florida, weighing in on everything from the employment status of Deputy Attorney General Rod Rosenstein to Taylor Swift's foray into politics to endorse two Democratic candidates. He said he now likes her music "about 25 percent less." On Tuesday, Trump began his day with a surprise press availability announcing that U.N. Ambassador Nikki Haley would be leaving her post at the end of the year. After holding forth for nearly 20 minutes, it seemed Trump had, for the moment, exhausted reporters' questions. "Any other questions?" he asked to rare silence. But that was just the beginning. Trump's day also included an Oval Office interview with New York Magazine, a 15-minute question-and-answer session with reporters on the South Lawn as he departed the White House for a rally in Iowa, and another conversation with reporters aboard Air Force One. Trump also recorded an interview with the local NBC affiliate before taking the stage at his rally, which lasted well over an hour. On Wednesday, as Hurricane Michael was about to make landfall, Trump began his day with a storm briefing, during which he also took questions on topics including a missing Saudi journalist and potential replacements for Haley. 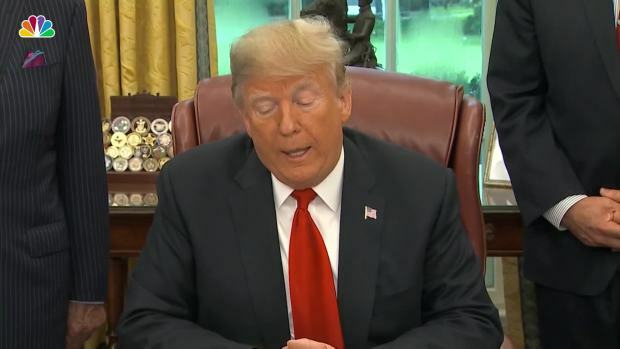 He also took questions at a bill signing and after landing in Pennsylvania for another rally, where he said the Federal Reserve had "gone crazy." 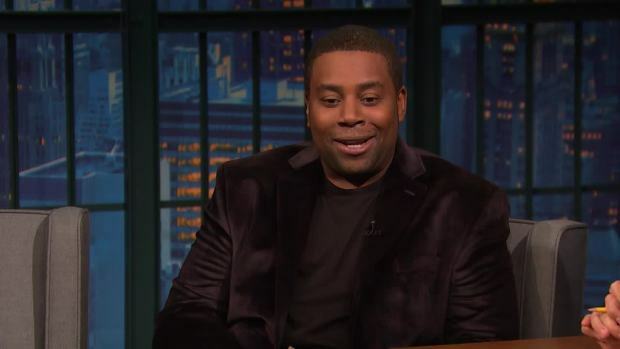 Kenan Thompson chats with Seth Meyers about the season premiere of "Saturday Night Live," as well as Kanye West's unaired pro-President Donald Trump speech following the show. After his rally and interviews with the Washington Examiner and a local television station, Trump headed home. But he wasn't done for the night. There was one last call, at 11 p.m., to Fox News Channel's Shannon Bream. Less than 12 hours later, Trump was back at it, spending more than 45 minutes on the phone answering questions from his favorite hosts at "Fox & Friends." Yet to come: Chatting at two bill signings, including one attended by Kid Rock and other musicians, a forum on drug trafficking, and that epic pre-lunch appearance with Kanye West. As Trump headed to lunch with his guests, he was anything but talked out: "We're going to have lunch," he said. "We're going to talk."